BHV Department Store: Explore Paris' Favorite "Bazaar"
Why It's the Locals' Preferred "Bazaar"
The Bazaar de l'Hotel de Ville, known simply as BHV to locals, is an always-bustling department store in the smack center of Paris.The slightly less glamorous, but more friendly and accessible, sister of chic stores like Galeries Lafayette and Printemps, BHV is an old-world treasure trove. You can get lost for hours in its many aisles, boasting a dizzying array of high-quality goods at a variety of price points. 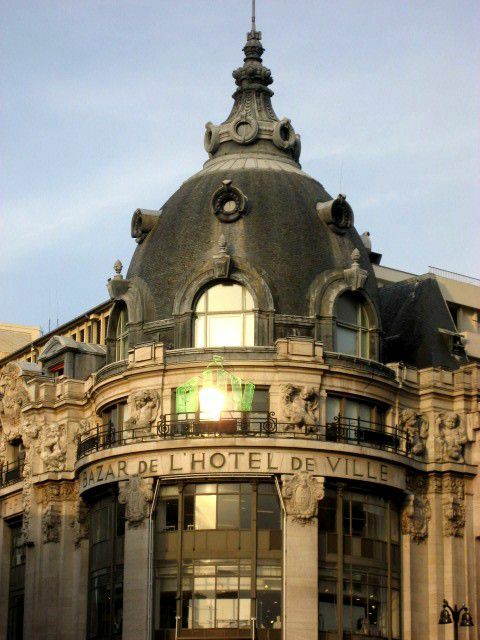 Situated right across from City Hall (Hotel de Ville) after which it's named, the old-world department store, easily recognized from down the road by its iconic domed roof and bright green sign, first opened in 1856. It's not quite as famous as the department stores of the so-called "Grands Boulevards", but locals tend to prefer coming here since it's less overrun by tourists, and offers a solid selection of men and women's fashion and other goods. Also very well-known for its extensive home and hardware sections-- you'll have to brave the cavernous basement to access this treasure trove-- BHV's flagship on Rue de Rivoli also has sizable sections devoted to beauty, fashion, accessories, books and crafts, as well as a separate men's store, wine shop and even a zany pet accessories outlet. The main building is located on Rue de Rivoli and houses women's fashion and accessories, beauty products, home furnishings, office supplies,luggage, and an extensive hardware and home improvement section in the basement. BHV Homme is dedicated to men's fashion and accessories and is located on 36 rue de la Verrerie, the street behind the main store. BHV La Cave is a wine shop offering wine tastings and a selection of French and international vintages, as well as accessories. It's located on 13 rue des Archives. There's a ton to see and do in the local area. Take a walking tour of the historic Marais district, and experience its medieval foundations as well as its ultra-contemporary, cosmopolitan vibe today. Go catch an opera at the nearby Bastille, or visit the Picasso museum--it's recently been renovated and offers one of the world's finest collections of Picasso's works. Care for a rooftop drink? The Perchoir is one of Paris' most beloved rooftop bars, and perfect for a pre or post-shopping session break. Finally, just a few blocks over from the store is the Centre Georges Pompidou, the genuine contemporary heart of Parisian life, with a modern arts museum and cultural center, rooftop restaurant with panoramic views, cinemas, and more.